Clamour for change led to the birth of the orphanage movement. 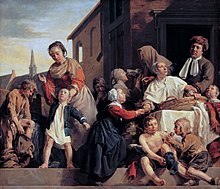 In England, the movement really took off in the mid-19th century although orphanages such as the Orphan Working Home in 1758 and the Bristol Asylum for Poor Orphan Girls in 1795, had been set up earlier. 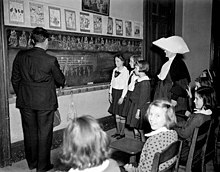 Private orphanages were founded by private benefactors; these often received royal patronage and government oversight.Ragged schools, founded by John Pounds and the Lord Shaftesbury were also set up to provide pauper children with basic education. ^ "Milton Hershey School Website". 21 July 2018. ^ Segedin, Andy (17 May 2016). "Hamilton Boosts Orphanage's Story, History". The NonProfit Times. Archived from the original on 27 November 2016. ^ "The Bucharest Early Intervention Project" (PDF). Retrieved 1 July 2013. 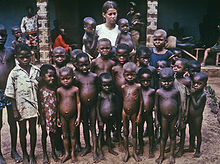 ^ a b c "Aid Gives Alternative to African Orphanages". nytimes.com. 5 December 2009. Retrieved 9 January 2016. ^ "Albanian's Children Photo". Adoptionworx.com. Retrieved 3 April 2012. ^ "Helping Orphans in Bosnia and Herzegovina". Soschildrensvillages.ca. 21 March 2012. Retrieved 3 April 2012. ^ a b "Tyvärr hittar vi inte sidan du söker" (PDF). Humanrights.gov.se. Retrieved 1 July 2013. ^ "Tyvärr hittar vi inte sidan du söker" (PDF). Humanrights.gov.se. Retrieved 1 July 2013. ^ "Viewpoints: Balkan boost for EU". BBC News. 16 January 2007. Retrieved 3 April 2012. ^ "The new Romanian orphans". Childrights.ro. Retrieved 3 April 2012. ^ "Microsoft Word - Slovakien.doc" (PDF). Retrieved 1 July 2013. ^ "Poverty forces Kabul parents to send kids to orphanages". Christian Science Monitor. 3 June 2002. Retrieved 17 October 2011. ^ "Pakistan's Orphans". The Nation. 21 May 2016. Retrieved 15 December 2018. ^ Reitman, Valerie (6 March 1999). "S. Korea Tries to Take Care of Its Own With Domestic Adoptions - Los Angeles Times". Articles.latimes.com. Retrieved 2 February 2013. ^ "Alternative family care technical briefing paper.pub" (PDF). Retrieved 1 July 2013. ^ "casahogarjeruel.org". casahogarjeruel.org. Retrieved 2 February 2013. ^ "About Hope Children's Home". Hope International Ministries. Retrieved 15 July 2017. ^ Paul deHolczer (14 March 2014). "Are There Any Traditional Orphanages in the US?". Huffington Post. Oath Inc. Retrieved 15 July 2017.